Manufacturer of a wide range of products which include refinery catalysts. 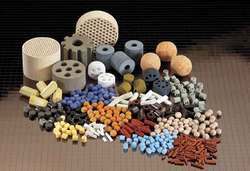 We are offering different types of Refinery Catalysts. These products are basically used as Purification Catalysts are precisely formulated that makes it high in qualitative terms. These products are offered at best market leading prices. Types of Refinery Catalysts are Nickel Reformer Catalysts, Palladium Catalysts, Moly Tungsten Catalysts, Ruthenium Catalysts, Platinum Catalysts, Silver Catalysts, Rhodium Catalysts. Looking for Refinery Catalysts ?